A merry Christmas to all, and to all a good 2018. In celebration, and to give everyone a fun, indoor activity away from the cold, I present Xmas eXcavation (click to play). 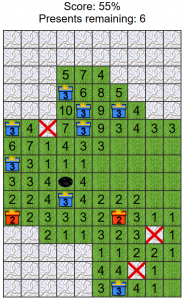 The game will be familiar to any Minesweeper players, but with one key difference: you’re trying to locate and uncover presents hidden under the snow, while avoiding the dirty lumps of coal. Double click (or tap) to uncover a patch of snow. Single click to mark a suspected piece of coal. Good luck! If double-tapping causes your phone to zoom, you might have to check your settings as some browsers allow you to choose to override any attempts to override the default behaviour. Very irritating for programmers! Every time you start a new game (or refresh the page) the game grid is drawn from scratch with a random assortment of presents and coal. The script creates a table one cell at a time and decides whether each cell should contain an item. The default game difficulty is 13. This means that, for every cell, there is a 13% chance that the cell will contain an item, and a 87% chance the cell will be empty. It’s random, so sometimes you’ll end up with a slightly easier game, sometimes a little harder, but on average it will be a reasonable challenge for new players. There’s a hard mode for the more experienced, where the difficulty is ramped up to 20. If you want to go even higher, say to level 25, add “?=25” after the URL and reload the page. Or follow this link: http://dreamsofgerontius.com/scripts/xmasexcavation.html?=25. Once the presents and coal are added, the script goes through the whole board again, counting up the objects in order to store the clue numbers. The whole answer grid is stored as a 2D array and a test array containing the relative co-ordinates of the eight surrounding squares is used to quickly check each of them. When a square is uncovered, the contents are revealed and the score updated if the player uncovers an item. If a square is blank, that means there can’t be any items in any of the surrounding squares, so the game might as well reveal them all. And if any of those squares are blank, it reveals them too, and so on. There’s an animation routine to reveal the whole area one square at a time, every 5 milliseconds. This was the other tricky bit of the code to write, making use of an asycnhronous function and a “promise” to make the game stop while running the animation. I instead spent my time writing the music for achieving a perfect score. It’s a modified version of my God Rest Ye Merry Gentlemen arrangement I wrote a couple of years back for my YouTube Christmas Round Robin.